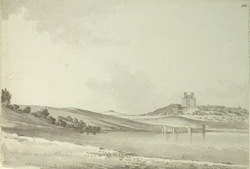 A view in ink of the plantations and the tower in the park at Newstead Abbey as seen from the opposite shore of the lake. After the Dissolution of the Monasteries in 1539, the 12th-century abbey was transferred to the Byron family. In 1749 the fifth Lord Byron (alias the "wicked" Lord), landscaped much of the park and built several Gothic-style castle follies and towers around the lake. His grand-nephew and the sixth Lord Byron, later to become the great Romantic poet and icon of his times, inherited Newstead at the age of ten.